This is right in one sense, but wrong in four. If the aim is to explain why UK output is so far below trend, then looking at fiscal policy is not going to get us very far. We need to look elsewhere: maybe at why consumers are saving so much more than they used to, or why UK productivity has fallen so far. Yet, although I have written posts about these things, I have written much more about fiscal policy. Why? The first reason Chris Giles is wrong is that 3% of GDP, or whatever it is, is an awful lot of money and resources. In my post on the Jorda and Taylor estimates I put the total cost of austerity from 2011-13 (roughly 1% of GDP in 2011, 2% in 2012 and 3% in 2013) at £3,500 per household. I would not call that unimportant. Think of all the hospitals and schools that could be built with 6% of annual GDP (nearly £100 billion). Or instead, let’s take the more conservative estimates recently provided by the OBR in the nice chart below. Jonathan Portes has already discussed the paper from which this comes, so let me just explain the colours and dig out the numbers. This looks at the impact of discretionary fiscal policy (changes the Chancellor actually makes) in successive years. The blue bar in 2009/10 shows the expansionary impact of the Labour government’s attempts to moderate the recession, which had a continuing positive impact (according to the OBR’s calculations) in subsequent years. But in 2010/11 this was outweighed by fiscal tightening in that year (light brown), some of which was already planned by Labour, but which the coalition added to. And so on. 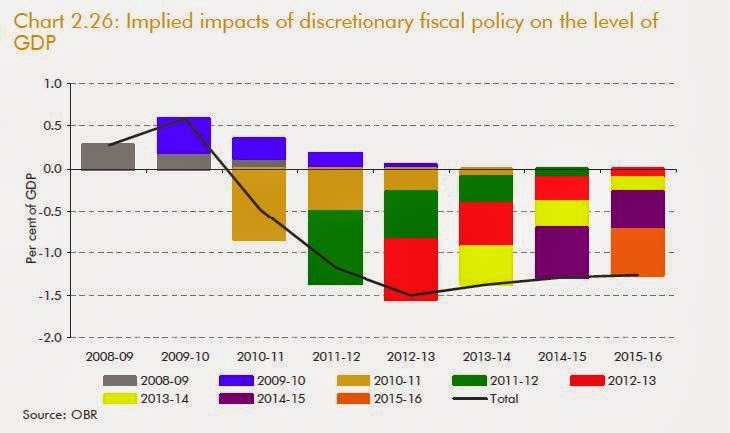 So if you add the light brown, green, red and yellow areas, you get the total impact of fiscal tightening on output from 2010-13, which is a bit above 5% of GDP. Not as high as 6%, but still an awful lot of money. And the cost goes on, as the chart shows. Now is not the time to get into detail about how these numbers are estimated. In particular, they are ‘expectations naive’, in that they assume policy has no impact when it is announced, but only when it happens. But however you estimate the numbers, any reasonable evidence based estimate is going to have the same order of magnitude – it is always going to be a huge economic cost. And that is not counting additional costs, in terms of the distribution of income, or the lasting damage of long term unemployment, or health. The second point is that this was something where the government had a choice. Most of the time GDP changes for reasons that governments have very little control over, except perhaps in the longer term. If GDP is low because banks, firms and consumers are adjusting their balance sheets, there is very little the government can do to stop them. (Monetary policy can try to discourage them making this adjustment too quickly, but as we know, interest rates cannot go below zero.) But discretionary fiscal policy is, by definition, directly under the government’s control. Which brings me to the third reason why Chris Giles is wrong. The baseline here should not be ‘doing nothing’. There is nothing that says the best the government could have done was to be fiscally neutral in terms of GDP impact. As we can see, in 2009/10 we had fiscal stimulus, and this could have continued. Now of course there is a debate about how far fiscal stimulus could have gone: would the impact on inflation have been too great, or would the financial markets have panicked in a way that would have been harmful to the economy. But 6%, or 5%, is just the positive harm that government policy has done – it might have instead done some positive good. The fourth reason why I, and maybe others, might be a little obsessed about austerity is that governments, and regretfully a few economists, have tried to deny that austerity has had any impact at all. The public debate has often been about the sign of these effects rather than their size. When governments appear to ignore or contradict the bread and butter macro that academic economists teach their students, then I believe these academics have every right (and indeed a duty) to get a little hot under the collar. This is the other reason that I wanted to display this chart. In the past, both the Prime Minister and the Chancellor have been the first to quote the numbers crunched by the OBR when it suited them. So let them be consistent and honest. Why not say that the OBR estimate that their fiscal actions have kept GDP well over 1% lower than it might have been each year since 2011, and that this will continue, but that this is worth it because it prevented a debt crisis (or whatever). And if they will not do that, why cannot journalists quote these OBR numbers when discussing the merits or otherwise of austerity. Then let the people decide whether these numbers really are as small as Chris Giles suggests. Austerity is not the principal source of our difficulties. These are, I believe, largely caused by globalization and the consequent transfer of domestic productive capital overseas. Nevertheless, it would make sense to pursue a broadly countercyclical fiscal policy. Computer modelling suggests a heavy stimulus at the start of the downswing would have been beneficial - a stimulus now not so much. Unfortunately, advisory bodies such as the OBR in the UK and the CBO in the US have become risk averse in respect of government debt, particularly as they have no direct control to enforce consolidation when the economy improves. I therefore suggest the following solution. Years ago, many governments gave up control of monetary policy to independent bodies - typically central banks. My proposal is they do the same for fiscal stance. For example, the OBR could be expanded to provide a supervisory role over the budget. Governments still decide on where and how money is spent and taxes collected. It is just control of the overall fiscal impact that they relinquish. If a budget is too expansionary, the OBR can send it back with options for spending cuts and/or tax increases; too contractionary and it is returned with options for greater expenditure and/or tax cuts. The principal advantage is that a single body, can now make forward projections with a great deal more confidence that targets will be met. The OBR could then apply a sharp fiscal stimulus knowing that it can dictate the timing and scale of fiscal consolidation in the outyears. This would also lower the cost of borrowing as bond markets are now reassured that the debt will be repaid. I suspect even politicians may enjoy the loss of control - they can always blame the OBR if an election promise fails to be delivered! It has always been a constant source of economic stress that the political process strongly favours a procyclical fiscal stance, the exact opposite of what is required. When times are good it is difficult for politicians to avoid the imperitive to spend, especially when trying to get re-elected. When a recession looms, not only have they already spent most of the fiscal ammunition, they are now under a political imperitive to cut expenditure as people blame the profligacy of the past for their current woes, again the opposite of what is needed. Perhaps relieving them of that responsibilty might provide us a more sustainable path to future prosperity. Globalisation has been gathering pace for the last two hundred years. The British Empire was globalisation writ large. So globalisation does not explain the problems of the last 5 or so years. Also, it makes no sense for two different bodies or committees to decide on stimulus (the BoE MPC and the OBR). The above mentioned publication advocates merging the two committees – an idea I agree with. Floxo - The creation of fiscal councils like the OBR can be seen as a partial move in the direction you advocate. I discuss issues involving delegation more generally here: http://mainlymacro.blogspot.co.uk/2012/12/delegation-and-accountability.html. Giving fiscal councils control over budget deficits is certainly an idea that should be discussed, although it would be fiercely resisted by some. We can already see in the Eurozone and Sweden the dangers of giving power over monetary policy to unelected bodies. Thankyou for your replies. I herebye cheerfully relinquish any ownership of what is, after all, a very old idea. Apparently, the Republic of Genoa was subjected to fiscal discipline by an independent body impressively titled the "Officium Procuratorum Sanctii Georgii Super Diminutione Debitorum" - San Giorgio for short. Loosely translated, an official authority to lower government debt. It lasted three centuries so I guess it must have been successful. Professor Michele Fratianni discusses San Giorgio in an interesting paper on Genoan economic history. The idea of independent fiscal oversight has, of course, been proposed a number of times since, but has never really gained much traction. The motivation for it now is obvious. We all agree that the current prolonged recession has been disastrous. We also believe it may have been almost completely avoidable. Imagine how different things might have looked had we entered the downturn with a small surplus and a fiscal committee prepared to invest in a heavy, broadly based stimulus package. An output gap would have opened temporarily but would soon have closed as the stimulus started to bite. With little output actually lost, the fiscal committee would, I suspect, have had little difficulty in later repairing the fiscal position in readiness for the next downturn. Instead, we entered with substantial debt and political paralysis. Without a steady hand, the opportunity to reverse the downturn was lost, despite the best efforts of commentators such as Simon here and Paul Krugman in the US. The point is that fiscal oversight might just give us something the political process will never achieve. A well planned, countercyclical fiscal policy. I agree, Simon, that any such body would have to be fully accountable. It would need to publicly explain its decisions and publish the models on which they are based. A willingness to engage with external institutions and discuss alternative views would also be appropriate. I note that in your article you seem broadly optimistic, despite some reservations. Perhaps, one day, we will have our own San Giorgio. You will not find the term 'fiscal stimulus' since 2008 being used on the BBC, in reference to the UK or Japan. Something is clearly afoot, but what? I think of the BBC like this. Since the end of the Third Programme, contact with the universities by the BBC has been institutionally patchy to say the least. Radio Four has perforce become the grammar school stream, and Radio Five (starting in 1994) the secondary modern stream. Now, those editing these BBC news programmes, as they have moved in the last generation further to the newspapers' agenda, have seemingly failed to notice that in the UK as in the western world the number and size of universities (mostly paid for by the state, like the BBC) has been increasing, especially since WW2. As has the number of graduates. So the question is how long the BBC can ignore/supress the ZLB, liquidity trap orthodox interpretation of the economic crisis and its bogey term 'fiscal stimulus'? I wonder if those economists Skidelsky organised in his petition should concentrate their pressure on the BBC, as I think they could be and should be forced to change. I talked about the BBC's reporting in this post: http://mainlymacro.blogspot.co.uk/2013/07/behaving-like-luddites.html. As I note there, they did hold a seminar on the issue. I think there are two major problems. First, the pressure that they have been very publicly put under from the government will always have more effect than anything coming from academics. Second, I'm afraid to say that economists employed by city institutions have a disproportionate influence. There are some very good city economists, but also some not so good, but they are always available to the media (its their job). I also confess that, given how the BBC often treats climate change, I'm not optimistic that the BBC's reporting on macro issues will improve. But we should not give up! Does the debate also need to consider the impact of the fall in North Sea output in the last half decade? David Smith is the only person who ever seems to mention this. "What does this show? Note that the chart shows the impact of fiscal consolidation (divided into the effects of the different years in which different consolidation measures took place) on the level of GDP, not the growth rate." However your summing it together to find a bit above 5% seems to indicate it's the effect on the growth rate. Which is it? Isn't your calculation a little disingenuous, because it implies that this cost from fiscal tigthening could have been avoided entirely? No-one argues that the government did not have a large structural deficit by 2010-11. And no-one argues that such a structural deficit could have been run indefinitely - the intertemporal budget constraint must hold. Therefore fiscal tightening was necessary at some point, and so this cost in terms of lost output must be paid at some point. You can argue, of course, that multipliers were larger than normal from 2010-13, and would be smaller later on, making it better to tighten later rather than sooner. But that argument - about potential excess costs from tightening in 2010-13 relative to later on - is not what the OBR's chart or your 5% of GDP figure is about. The multipliers underlying the OBR's chart are not specific to a particular cyclical position, and so implicitly they give an estimate of the unavoidable cost from tightening fiscal policy to return to sustainability. That implies incurring the 5% cost was not a matter of discretion. “and so this cost in terms of lost output must be paid at some point.” No. Here is an MMTer's twopence. The time to consolidate is when the private sector is in irrational exuberance mode, and money just has to be confiscated from it in order to dampen things down. That confiscation shouldn’t result in any “lost output”: it simply prevents excess inflation. As to the national debt that exists till that time, just leave it in place, while ensuring interest on it remains slightly below inflation. That ensures that the state makes a profit out of its creditors: i.e. the state effectively charges private sector entities for creating the money they want, and for storing it. And if bond vigilantes force up rates, that’s no problem: just print money and buy back some debt, which forces rates down again. And if that’s too stimulatory, just raise taxes. The Zero Lower Bound is crucial here. If monetary policy is free to reduce interest rates, it can completely offset the deflationary impact of fiscal contraction. So if governments had waited until the economy had recovered, and interest rates had increased, then the output costs of bring down the deficit and debt could have been zero. I agree the issue of how impaired monetary policy is at the ZLB is crucial. In fact the argument that if interest rates are not at the ZLB then there could be no output cost to fiscal consolidation is a more extremely monetarist position than others, for example the OBR, would take. I should have been clearer in my original comment. The point that the OBR's multiplier estimates in the graph are not specific to the cyclical position of the economy means in particular that those multipliers do not assume the economy is at the ZLB. In fact they are based on empirical estimates of multipliers calculated from economies that were not at the ZLB. So the OBR implicitly do not believe in full monetary offset if interest rates are above zero. Hence the 5% output cost, in their model at least, is unavoidable. Personally, I think monetary policy can remain effective even at the ZLB. That implies multipliers can be small both in the 2010-13 period and in future. Some evidence for that is the reasonably robust growth in 2010-11, despite the sharp fiscal tightening illustrated in the graph. That would imply that the costs of tightening in 2010-13 were low, and no higher now than they would be in future. But in any case my central point was that it would be reasonable for the Government to argue that the 5% output cost implicit in the OBR graph would, on the OBR's view, have to be paid at some point anyway. The fact that the OBR obtained their multiplier estimates from past history without formally controlling for monetary policy is quite different from saying that they believe the ZLB has no impact. The former means that their multipliers are too low for a ZLB period, so their numbers on output are almost certainly too conservative. I do not think you should use how they got their multipliers to imply that the OBR believe monetary policy should not or cannot offset the impact of known influences on demand like planned fiscal consolidation outside the ZLB. This is not a monetarist proposition - it is just good policy. There may be some details here on the inflation/output mix, but it is not obvious which way they go. Anyway I would love to see the government try and make the argument you suggest. At the moment they seem to want to avoid any discussion of the impact of their fiscal policy on output. Prof Simon, Re your 8.49 comment, you seem to claim that an above ZLB rate is needed if debt reduction is not to have an output cost. Strikes me that at ZLB, the government / central bank machine can perfectly well print money and buy back any amount of debt it wants, i.e. do as much QE as it wants. Of course the relevant debt is in theory still there: its in the hands of the central bank. But that debt is meaningless, as various aricles in the FT and WSJ have pointed out: i.e. that debt might as well be torn up. As to the possibility that the private sectors’ increased stock of money might be inflationary, as I pointed out above, that’s easily dealt with by increased tax. And any such tax does not have an “output cost”: it simply prevents excess inflation. While I do agree that today's austerity has caused damage, I think policy should be obsessed with what Britain should be like in the future. The whole conservative idea of a surveillance state that reduces help to those in need, but makes sure that banks remain deregulated has failed. So where does Britain want to be in 10-20 years? In the same corner? Totally dependent on others? With a foreign policy which is nothing but "what the US says"?